One of the more annoying and error prone areas of repetitive work in AutoCAD is the renumbering of blocks attributes or text. For example, the numbering of grid lines and layout numbers can be a mindless bore. The following renumber VBA program creates a simple user interface to automate the chore of renumbering block attributes, Text and Mtext objects in a drawing. To use the program, the starting number (or text value) is entered by the user in the textbox on the form. The user then presses the Renumber button and selects Text, Mtext, Block (with attributes) objects in the drawing. 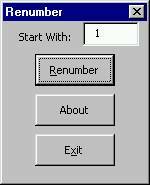 After the user has finished selecting all the objects to renumber (in sequence one by one), the user presses the Enter key. The renumber program processes the selected objects (in sequence as selected). After processing the selected objects, the renumber program shows the next number in sequence just in case the user has more numbering to do -- starting with the next number. What you will need for this program. 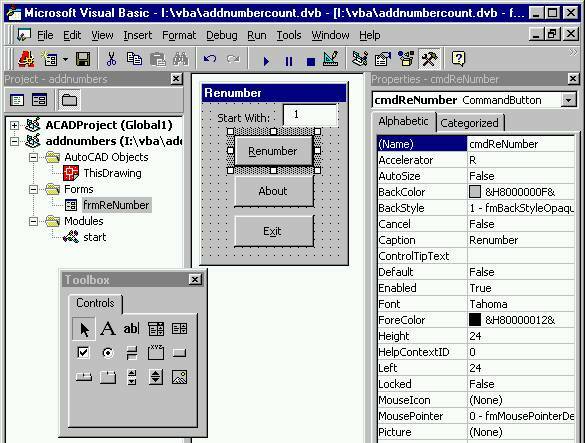 AutoCAD r14.01 or AutoCAD 2000 with the VBA install option enabled (when AutoCAD was installed). To check if the VBA editor is installed in your version of AutoCAD type VBAide at the AutoCAD command prompt. If you receive an AutoCAD error “unknown command” you do not have VBA installed. If you have VBA installed, the resulting window that pops up is the VBA editor. Once the VBA editor is open, create a form with three buttons (the About button is optional) and one text box as shown in Figure 1. For AutoCAD r14 users, check your version of AutoCAD at the AutoCAD command prompt type: ACADver. If you do not have AutoCAD r14.01 or better installed, see your trusty AutoCAD dealer for an update to r14.01 or 2000. The r14.01 should be a free update from your dealer. For the text box, set the (name) property to txtStartNumber. The renumber VBA program has several limitations as written. The program will only renumber the first attributed block text value (multiple block attributes are not supported). The program assumes that the user wants to change the first block attribute text value. Also, the program will not work with double letters (i.e. “AA”) but will work with any number. The program could also use a filter to let the user select a window of objects and then sort the objects based on the X and Y coordinates of the selected objects. 'Force all variables to be declared. "Renumber program -- Contract CADD Group"
' Build a selection set of group codes and values to search for: Blocks (inserts), Text, or Mtext.
' get the value in the Text box on the Renumber form.
' Set objACAD to the current running AutoCAD using the Thisdrawing object.
' Hide the renumber form.
' Select text, Mtext or Blocks onscreen using the group codes and values filter.
' If the user has not selected a suitable object (i.e. block with attribute), keep on picking!
' Check to see this object in the selection set is a block.
' Get attribute value(s) from the block.
' We will use only the First attribute in the block found at location Zero.
' attribs(0) is the first block attribute value.
' Note, most programs uses Zero-based counting & therefore the first number is Zero when counting rather than one.
' Update the block so we can see the new Values applied to the block attribute values above.
' This is similar to a localized regen, only the block is updated/regenerated.
' this function returns an incremented number or text value.
' For this project we are only incrementing by one.
' As the user types in characters in the Textbox on the Renumber form, the text is changed to uppercase.